By Merge – Simple, I don’t mean to imply that it is simple to merge. What I mean is that there is more than one way to do this, and the methods vary in complexity. 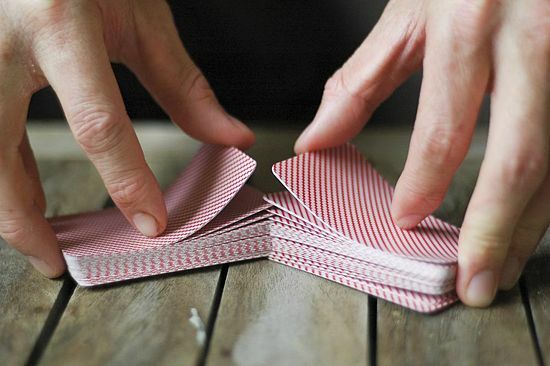 This method is less complex than some others. I sometimes tell my wife that Delete is almost always a problem. Delete is almost never the solution. 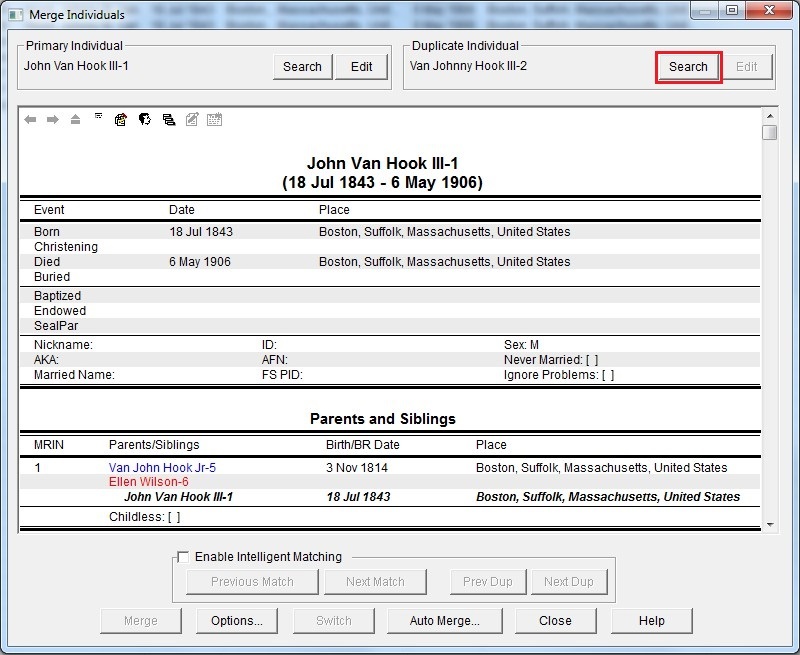 For this example I created a record for Jonny Van Hook III. 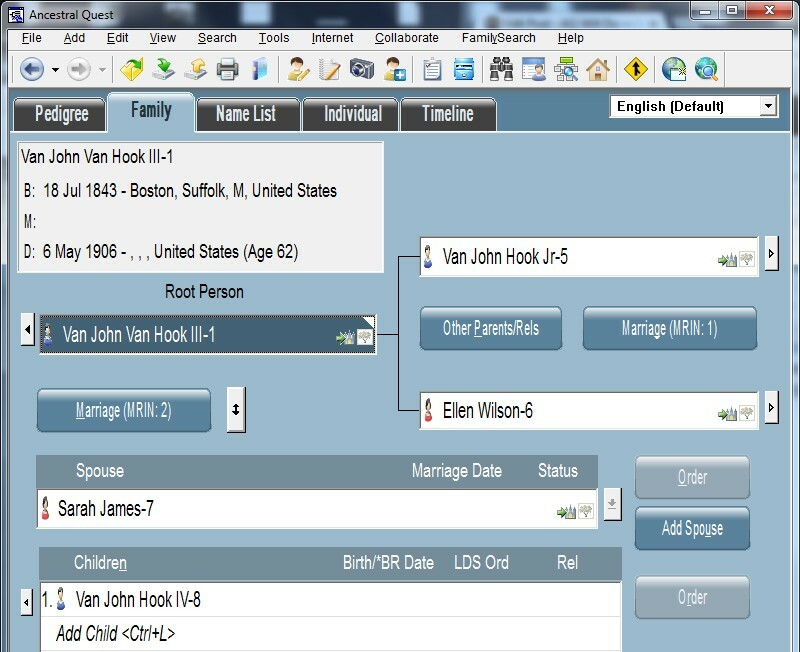 Since the Dutch recognize the Van part of the Surname as a Prefix, and because Ancestral Quest does not store a separate Surname Prefix, I mistakenly store the Van in the Name Prefix field. I also use the Nickname, Johnny, instead of his real name, John. I mistakenly omit the county from the Birth Place. 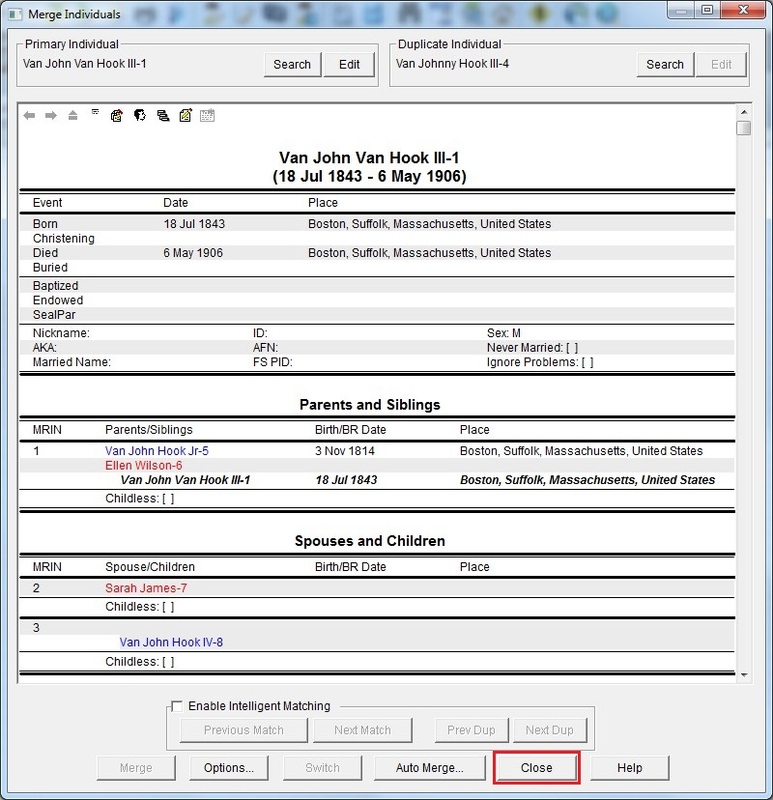 I export the record via GEDCOM, then I import it three times. I now have four identical records. I correct the first record, so that I will have fields to contrast during the Merge process. I create parents for RIN number 2. I create a spouse for RIN number 3, and I create a son for RIN number 4. This is the Name List. The RIN 2, RIN 3 and RIN 4 records are identical except for the RIN and their relationships. The record with RIN number 1 is highlighted. The record with RIN number 2 is not needed, so we will merge it into the first record. To do this we click on the Merge icon. 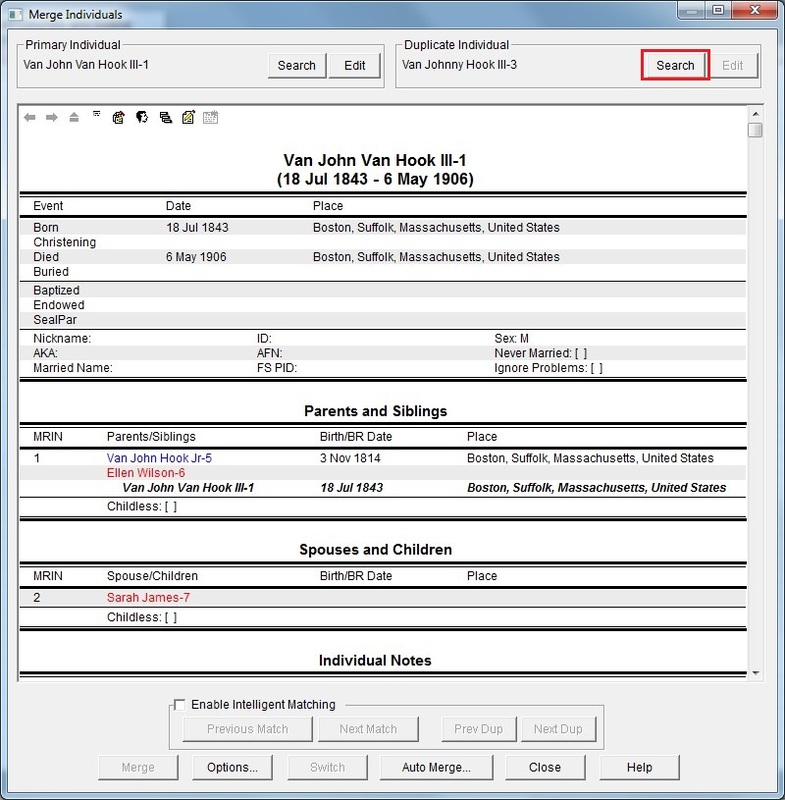 The highlighted record does not get listed in the Merge Individuals screen. To get it there we must click the Left Search button. 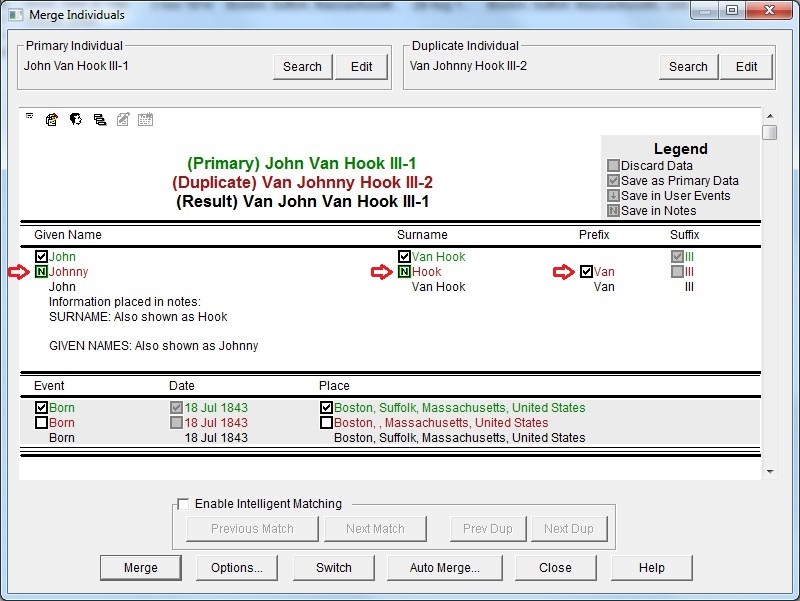 The Left Search button selects the Primary Individual. Record 1 is selected, so we click the OK button. Next we select the record with RIN number 2. To do this we first click the Right Search button. 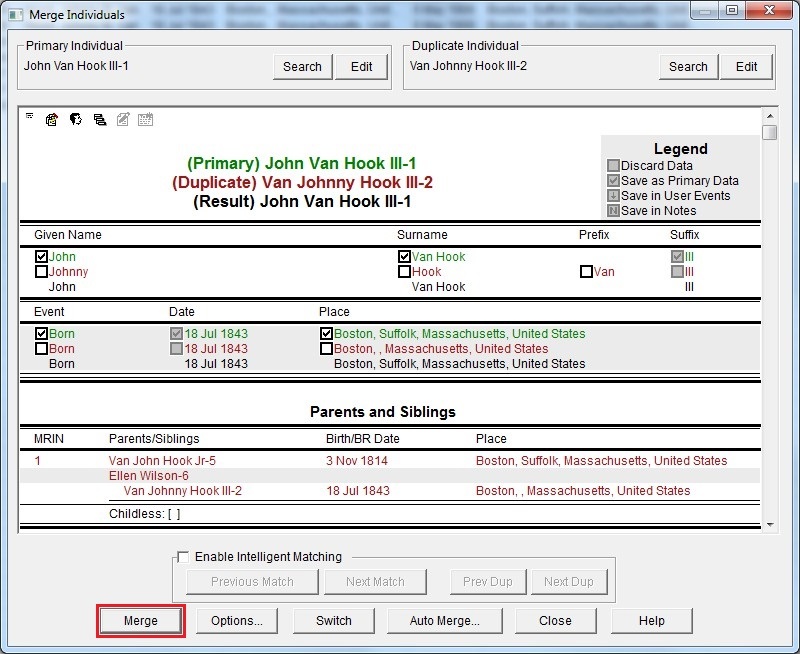 The Right Search button selects the Duplicate Individual. We enter 2 as the RIN and click the OK button. We correct the errors in the Name fields by clicking on the squares which are pointed at by the red arrows. We click each until it becomes a blank square. If we had wanted any of those name pieces to go into Notes, we would have stopped clicking when the square was filled with the letter N on a green background. Name pieces cannot go into Other Events, however other fields like dates and places can. If we wanted such a field to go into Other Events, we could stop clicking when the square was filled with a downward pointing arrow. Ancestral Quest recognizes that a Place Name with all four parts is better than a partial Place Name, so it defaults to selecting the correct one, with nothing in Notes or Other Events. Note that the red Duplicate record had parents linked to it. These will be linked to the Result record after the merge. We click on the Merge button. RIN number 2 has been merged into RIN number 1, and RIN number 1 has the parents attached. We are now ready to merge RIN number 1 and RIN number 3. We click on the Right Search button, then enter 3 in the RIN number field and click the OK button. Here we follow the same procedure. We eliminate what we don’t want and take the rest. Note that the parents are attached to RIN number 1 and the spouse is attached to RIN number 3. After the Merge, RIN 1 will have parents and a spouse. We click the Merge Button. RIN 3 has been merged into RIN 1. Both the parents and the spouse are attached to RIN 1. Next we want to merge RIN 4 into RIN 1, so we use the same procedure. We click on the Right Search button, enter 4 in the RIN field, and click the OK button. We repeat the same procedure. We eliminate what we don’t want, and keep the rest. 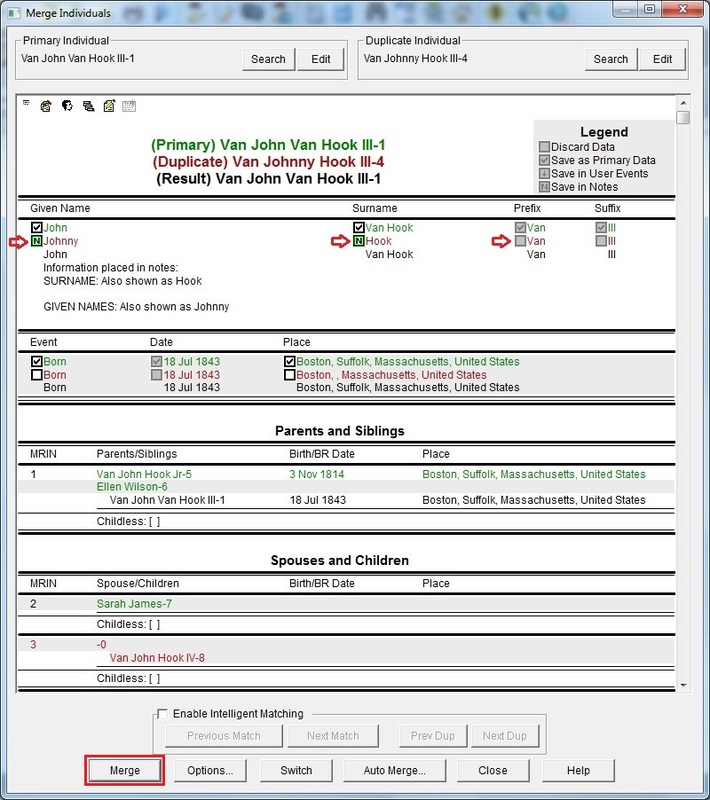 Note that RIN 1 has parents and spouse attached, and RIN 4 has a son attached. When we click on the Merge button, we will eliminate RIN 4 and RIN 1 will acquire the son. We click on the Merge button. RIN 4 is merged into RIN 1, which now has parents, a spouse, and a son. We click the Close button. This is the new Name List view with all duplicate records properly merged. Or are they? NO! During the last merge, RIN 1 already had a marriage with RIN 7. RIN 8 was a child in a marriage with RIN 4 and an UNKNOWN wife. When RINs 1 and 4 merged, RIN 1 now had two marriages. 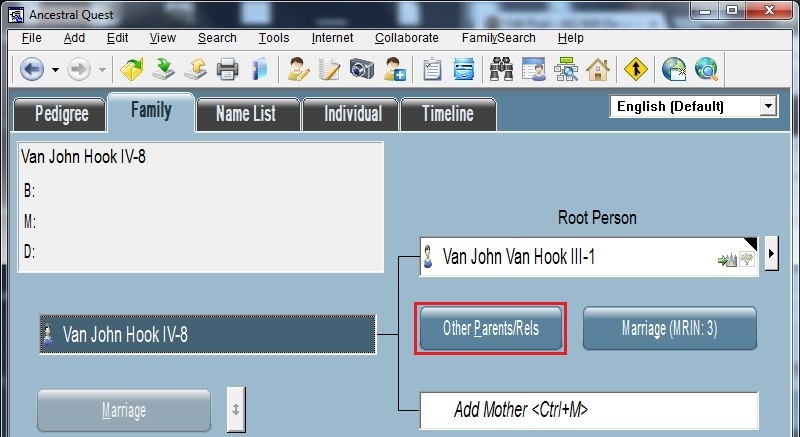 To solve this problem, move the son to the principle position by clicking on the arrow left of his name. Click on his Other Parents/Rels button. 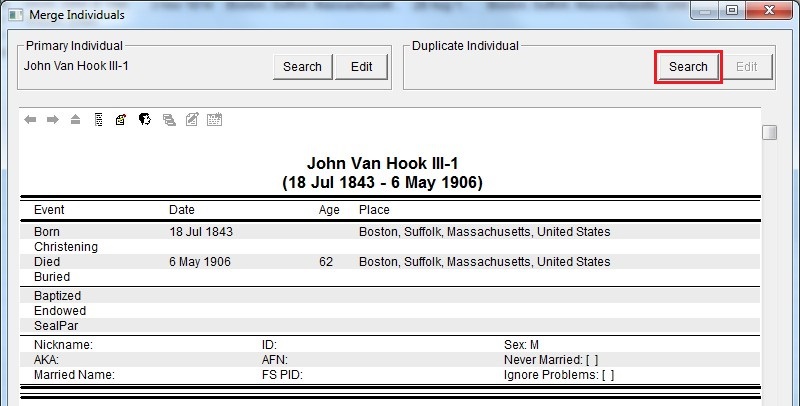 The first marriage was with the parents of John Van Hook. The second was with John and his spouse, Sarah James. The third marriage, shown above is between John and an UNKNOWN spouse. 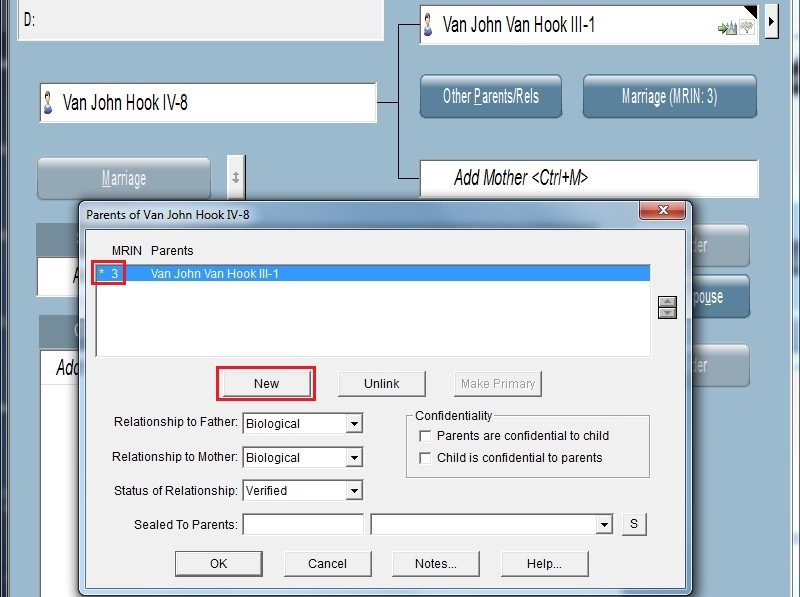 We want the son to be a child in a marriage with John and Sarah James, so we will add an existing set of parents to RIN 8. That set of parents will be John and Sarah, in MRIN 2. We click on the New button. We want to go find that marriage. 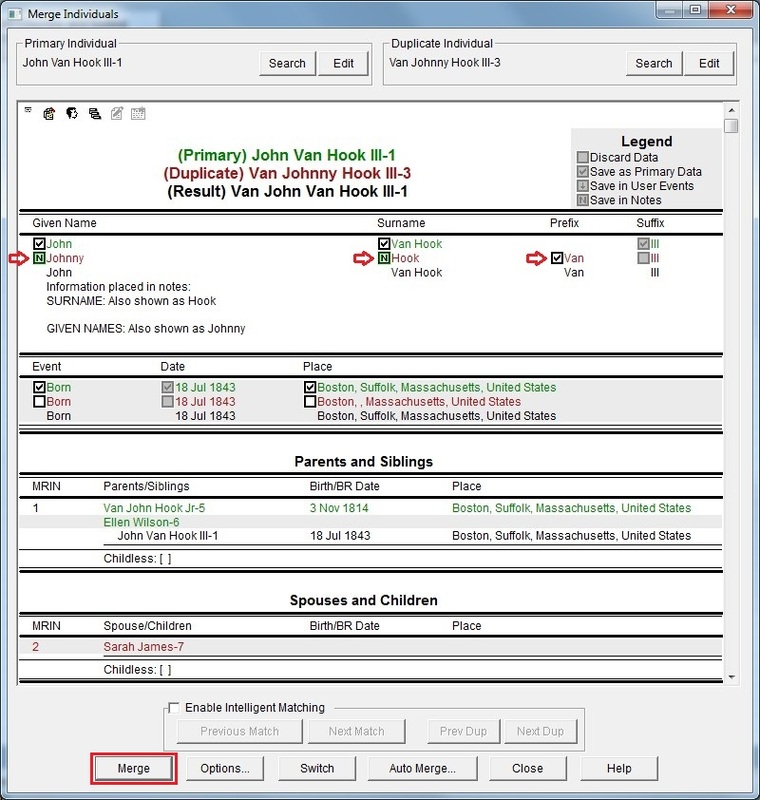 We click on the Search for Existing Parents button. If we didn’t know the MRIN, we could have used the Search for Marriage button, but we will enter 2 in the MRIN field and click the OK button. This is the marriage we want, so we click the OK button. 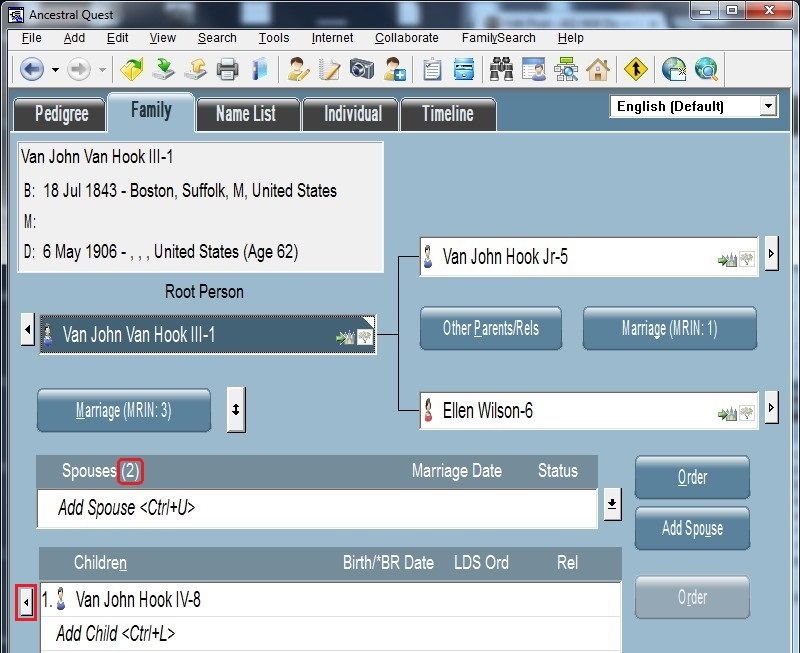 Now that the son is safely into a real marriage, we will click OK to get out of the Parents screen. The son is now a child in two marriages. To fix this, we put John in the Principle position, and select his UNKNOWN wife. We click on their Marriage button. the Merge process is completed. I’ll email you for clarification. WOW, love the way you make it look SO easy. The screens make it so clear. Thanks Dale. Leonard, thank you. I plan to do more in a series about merging. Few people understand _UID.